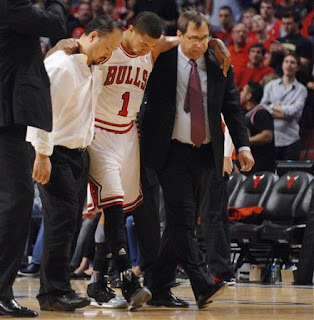 The 2012 NBA Playoffs opened today and with the exception of LeBron James' epic flopping in Miami's smackdown of the Knicks, 100-67, the big news was the torn ACL of Bulls star guard Derrick Rose late in Chicago's 103-91 victory over the Philadelphia 76ers, which will keep him out for the rest of the postseason. What does this mean for the top seed in the East? When a lose a guy as good as Rose, it will always negatively affect your team, especially considering how vital Rose is to Chicago's offense. When you watched the game today, Rose was just fantastic across the board but he really is the key guy on offense. With him out, they are not a championship team. But I still consider the Bulls the favorite in this series. The Bulls have played a lot without Rose this season and they were pretty good; 18-9 in games with Rose not playing. Both C.J. Watson and John Lucas III were very solid this season running the point in a more traditional style than Rose does in a pass-first, facilitator manner. Chicago's defense is still so damn good and with Philadelphia struggling to put the ball in the basket, I still think Chicago gets past them. Heck, I still think Chicago will get to the Eastern Conference Finals as their defense is just that good. But they have no chance against Miami sans Rose. But if Miami gets upset by somebody, who knows? Now while Chicago's season is certainly not over, their championship dreams are.